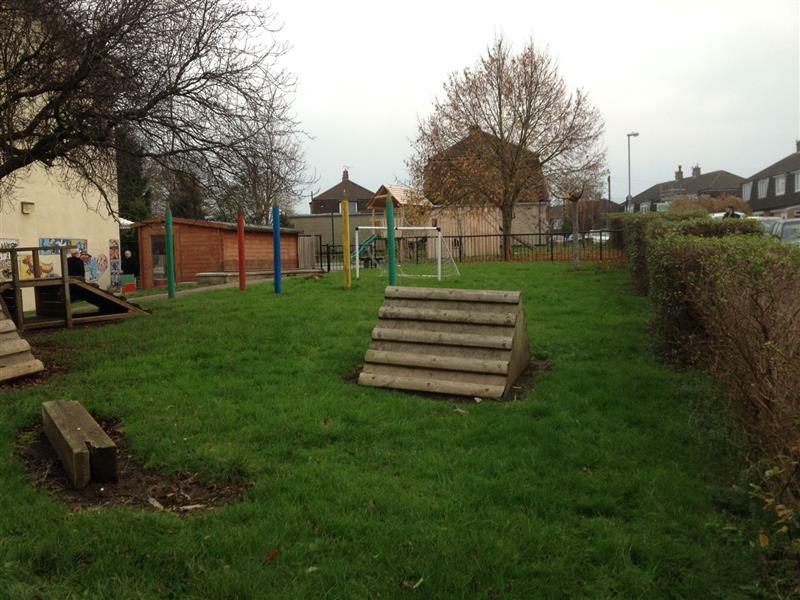 We met with St Teresa’s Primary School to discuss developments to their early years outdoor learning environment. Their area had limited play opportunities and was also underused due to terrible groundwork and muddy patches that worsened during difficult weather seasons. “The play equipment was old and rotting. The area really wasn’t appealing to the children and the play at times had to be guided due to some areas not being usable. Mud was a massive problem and at times it got that bad that the area couldn’t be used at all. 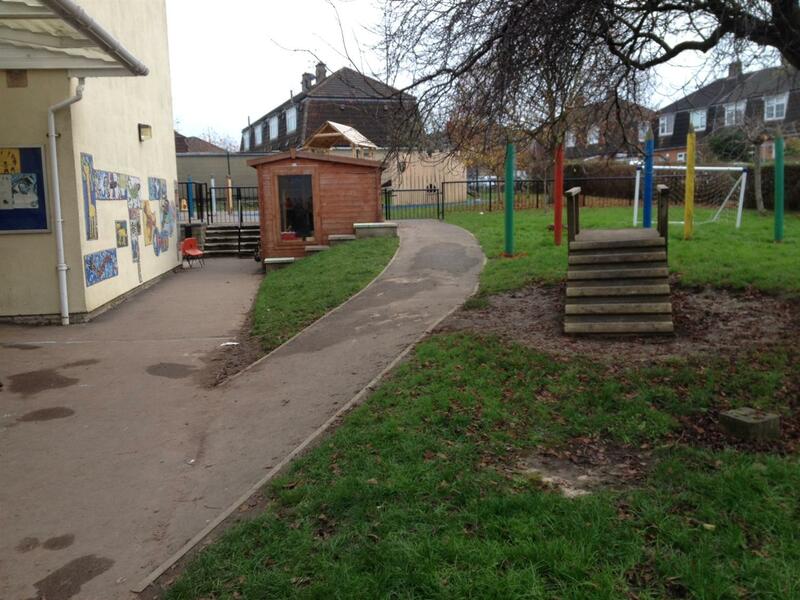 We have a slope, so you can imagine how dangerous the mud made this for our EYFS and reception children”. The equipment looked dated and the area as a whole, wasn’t very inviting for children to lead the play. The space wasn’t well zoned and the horrendous mud conditions made the playground limited. One thing we noticed, was the lack of resources for imaginative play; the children needed something to spark their imaginations and creative thinking. 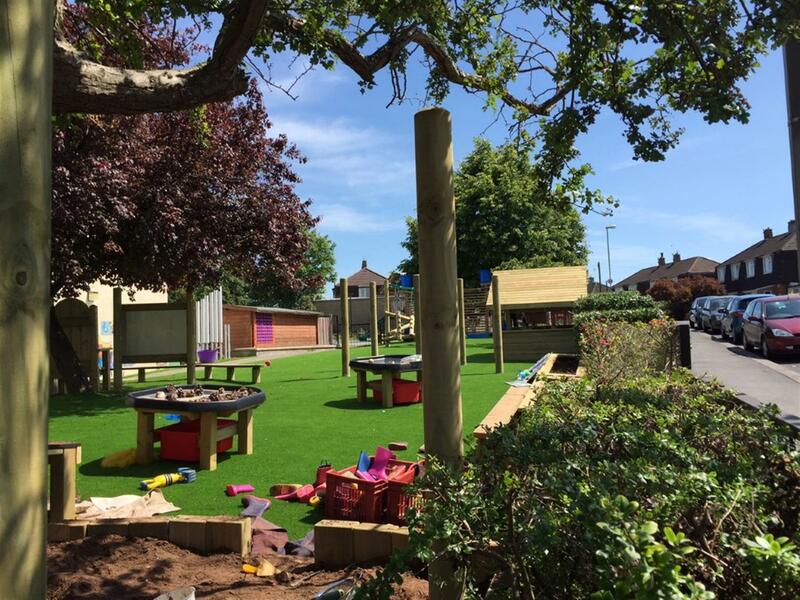 To overcome the mud infested grounds, we decided to re-surface the entire area into an all-weather resource with our green and natural looking Playturf. 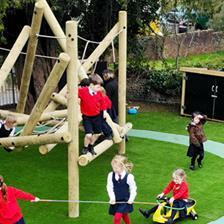 The artificial grass fibres it uses are unaffected by mud and are excellent for draining water. This means children can enjoy play whenever they wish and the bright green colour makes the area attractive and inviting for children to play on. With the limited resources they notably had, we had to provide children with plenty of open ended resources to better promote child-initiated play. As well as this, our equipment, designs and zoning needed to stimulate children's imaginations and make them want to explore, investigate and learn effectively. At one of end of the area, we installed our captivating Water Wall which is an ideal resource for investigative play and learning. The free flowing funnels and moveable parts allow children to manipulate water to better understand how water flows and other scientific theories including source to mouth, water recycling, kinetic energy, flow and gravity, balance and equilibrium. 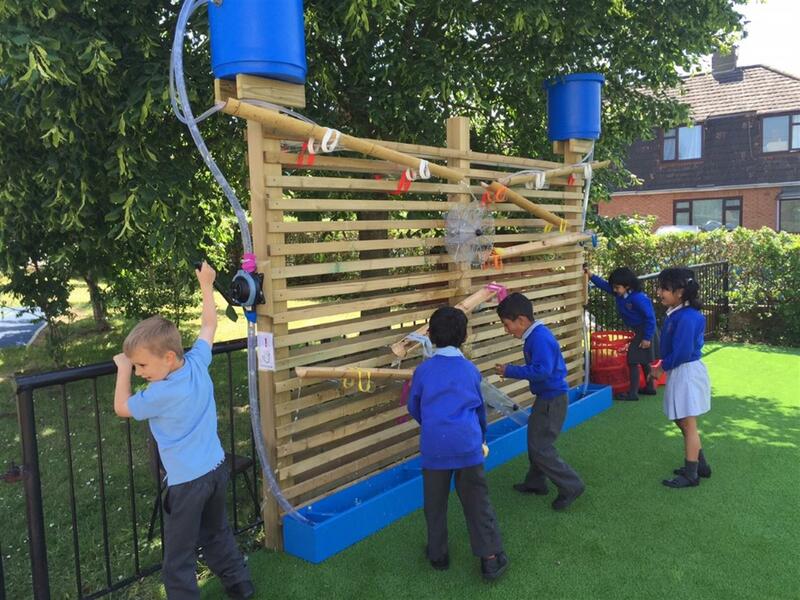 With endless learning possibilities and children's fascination with water, the Water Wall was the ideal inclusion for St Teresa's outdoor learning environment. The once dangerous slope, is now an area used to promote music through our specially designed Tuned Playground Chimes and African Drums. Our musical play equipment influences children to work together to create music, develop their creative abilities and further enhance their PSED and social understanding through turn taking and collaboration. 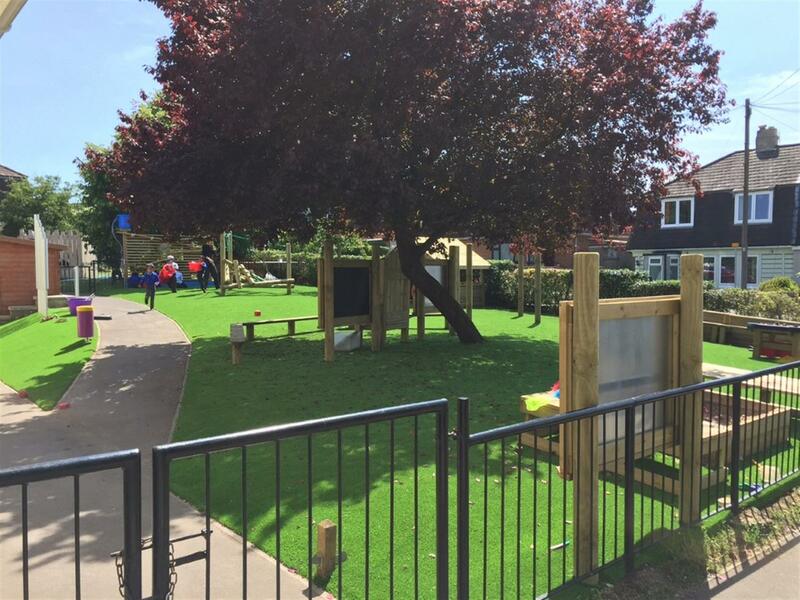 The Playturf has made the slope safe for children to begin their musical careers. Importantly, we added our Giant Playhouse because it is an influential open ended resource. On the day of our return visit, we saw the Playhouse had been transformed into a travel agents – this is relating the work of real people to role play which will teach children about the world around them. The practitioners of St Teresa's Primary School wil now only need to provide support and enthusiasm, rather than initiate ideas which will not only increase the children's imaginative development but also improve their social and communication skills. We also included Den Posts with eyelets fitted at the top and towards the bottom so that both the children and the practitioners could use it to develop their own unique dens. Again, this is fueling children's imaginations and creative abilities as they are free to ‘den make’ and turn their dens into anything from a house to a cave surrounded by water. It was important we added these open ended resources as we didn’t want the area to be too controlled, we wanted children to initiate and lead the play. 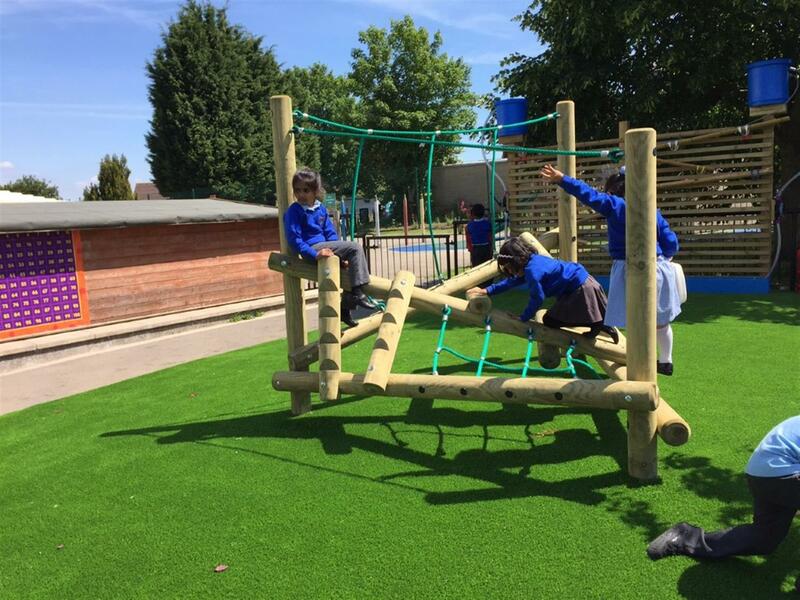 As Early Years children are filled with bundles of energy, we installed our Log Frame Climber as it is an ideal resource for physical development. It can be accessed and climbed upon from any angle of a child’s choosing and can also lend itself to imaginative play. To promote outdoor reading and writing, we added a Story Telling Circle. We specially designed this area to include Mark Making Boards so that children could not only read but write down their thoughts and new words they may have learnt. Also, the outdoors can really bring literacy to life so this was a great addition. For further social interaction and imaginative thinking, our Tuff Spot Table were included as children can play along the table surface together and even add themes to their play. To continue to promote natural play and offer an additional social hub, we installed Planter Benches so that children could grow plants and learn more about nature and wildlife. 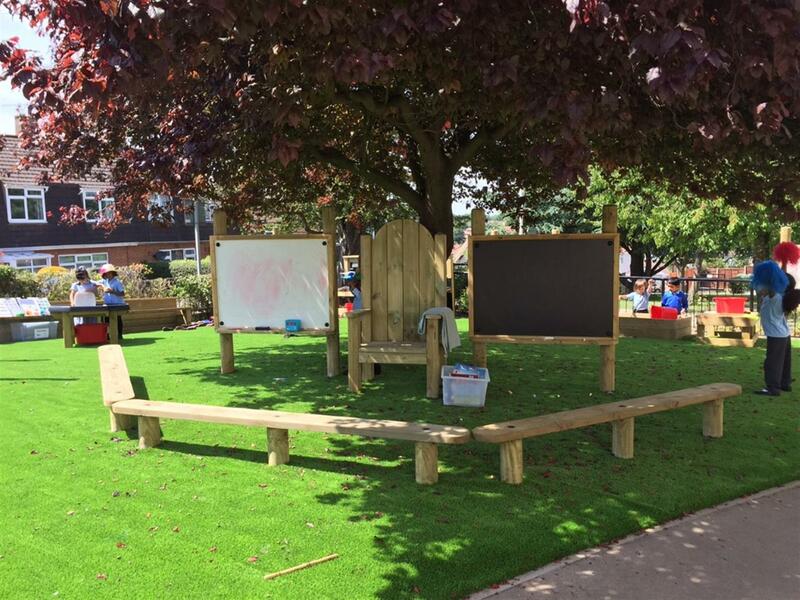 The benches provide a great place for the children to sit together and interact throughout the day, some may even find it a great place to relax and find solace during busy school times. Our Dig Pit was added to the corner of the outdoor environment. Children not only improve fine muscle control through digging and manipulating soil, they also use their imaginations to create activities such as digging for treasure. 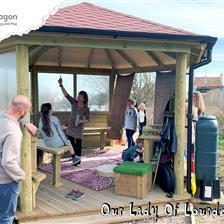 We installed our Mud Kitchen as it is a valuable resource for children’s knowledge and understanding of the world. It’s also great for PSED as children learn to take turns and communicate whilst creating the best mud pie possible. At the time of visit, 'Milo's Mud Pie' was on display which was a very muddy creation with elements of dry and wet mud. 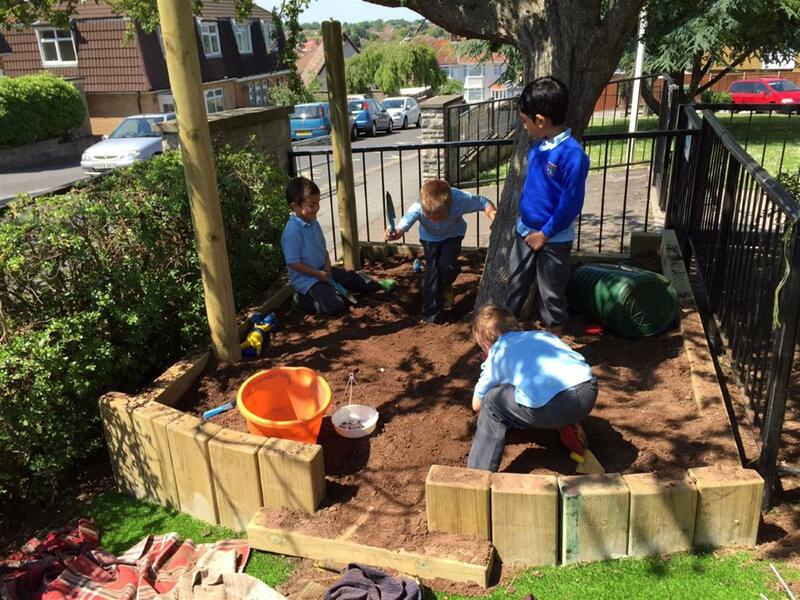 We then installed our Covered Sand Box as it is an essential addition to any Early Years environment as it develops numerous key areas including children's sensory and language skills. More Mark Making Panels were added to give children additional areas to get creative with writing, drawing and sharing their thoughts whilst in the inspirational outdoors. “Like the children, we’re totally amazed, it’s like Christmas every day. It was interesting to watch the children in their new environment and see which area they were drawn to first. After observing, we saw the children make gradual progression through their new resources. Now they understand each area and lead the play exactly as they want. 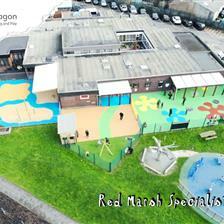 I must say, the area is zoned much better which is great to keep on top of children’s learning for the day." 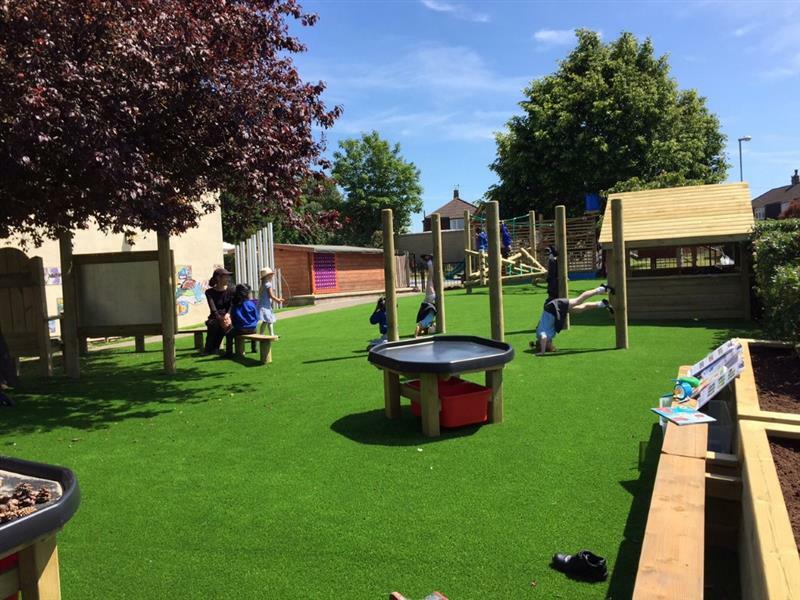 We're experts in creating engaging EYFS outdoor learning environments and understand how to develop entire playgrounds to meet any need you may have for your children. To learn more about our EYFS specialised products, visit our Dedicated EYFS Page or alternatively, contact us through our website.